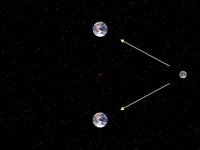 Content: This 2-scene video depicts a hypothetical orbit with eccentricity e = 1. Note: this never happens. Still, we can learn some interesting physics. It's what's called a gedankenexperiment (thought experiment). 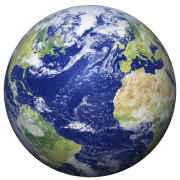 We place two identical Earths in mutual orbit around their barycenter. We position the Moon at a point equidistant from both Earths. Then we watch what gravity does. We look at the resulting "orbit" from two frames of reference (points of view). First, we observe from a frame that is co-rotating with the two Earths. Second, we observe from a frame that is fixed in space and not rotating. The appearance is strikingly different. Get this video plus the Teachers Notes (3 pages) for US $1.